Place the oats and berries or sultanas in a bowl and pour over 200ml cold water and the lemon juice. Leave in the fridge for 2 hours or overnight. The following morning, peel, core and grate 1 apple and slice the other one. Into the oat mix, stir the coconut, yogurt, almonds and grated apple. (The muesli will keep in the fridge for a few days, but don’t stir in the apple until you plan to eat it.) 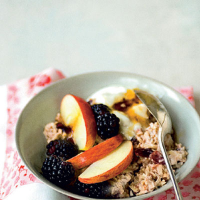 Transfer the muesli into bowls and top with apple slices and blackberries; drizzle with honey to taste.